Hang on to Your Seats, Surround Touch Technology Is Here! When surround sound first came out, we were all wowed by how real the gaming or viewing experience was. As the technology became better and better (with prices becoming more affordable, thank goodness), we simply fell in love with it even more. But technology doesn’t stop there. If you can’t live without surround sound, how about having “surround touch” to make things all the more real? While you may have your doubts, there is no denying that this is for real. It’s technically called surround haptics, a technology that gives tactile feedback to the user. So more than the having the sounds of your game envelope you as if you were actually in the setting, you can now also feel what is happening to you. An aside: the word haptics comes from the Greek language, and it simply means the sense of touch. Hence, saying surround touch is not really far from the target. Going back to the new technology…it was announced by Disney Research, Pittsburgh earlier this week. 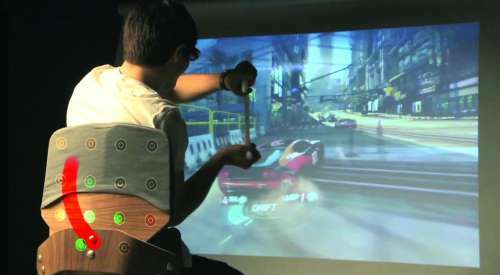 The surround haptics technology that they have worked on has been implemented via a chair. A chair may be a simple piece of furniture, but this gaming chair is anything but ordinary – or simple. In order for the surround touch technology to work, the gaming chair is fitted with tons of actuators which move depending on what is going on in the game. These movements give the user the sensation of reality. Believe it or not, the technology has so much potential that it can eventually give you the feeling of “flying or falling, of shrinking or growing, and of feeling bugs creeping on your skin”. ((Source)) I don’t know about you, but I think that it’s absolutely wonderful, although I am not sure about wanting to feel bugs crawling on my skin. As if I didn’t have too much of an imagination already! While the surround touch technology is currently in the form of the chair, the scientists and researchers say that it can be extended to many other things, including clothing. Needless to say, when surround touch becomes available to us (average people), gaming and watching movies will be taken to a totally awesome level.